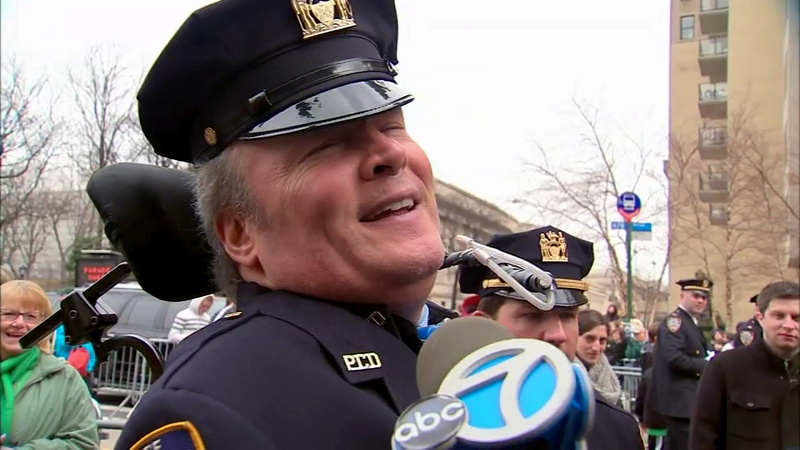 NEW YORK -- NYPD Detective Steven McDonald, who was shot in the line of duty in 1986 but later forgave the gunman, died Tuesday at the age of 59. The detective was on patrol in Central Park when he was shot in 1986 and had been paralyzed from the neck down ever since. McDonald had been in critical condition at North Shore University Hospital on Long Island since he suffered a heart attack last Friday. He is well-known for publicly forgiving the 15-year-old shooter Shavod Jones, who left him a quadriplegic following the shooting. Jones was later convicted of attempted murder. McDonald had continued as an active member of the police department despite the fact that he used a wheelchair and was only able to breathe with help from a respirator. New York City Mayor Bill de Blasio called McDonald "courageous and inspirational." "Detective McDonald has been a unique source of inspiration and unrivaled pride to people the world over," said NYPD Commissioner James O'Neill in a statement. "A quadriplegic, he visited police station houses, schools, church groups and more, spreading his message of faith, forgiveness, and peace. No one could have predicted that Steven would touch so many people, in New York and around the world. Like so many cops, Steven joined the NYPD to make a difference in people's lives. And he accomplished that every day." "Since that fateful day in 1986, Steven dedicated his life to fighting hate and encouraging forgiveness through his actions," said PBA President Patrick Lynch. "He was a powerful force for all that is good and is an inspiration to all of us. His, was a life well lived." McDonald believed what happened was God's will, to turn him into a messenger of God's word. On March 1, 1987, he read a statement about his feelings toward the teenager who crippled him and said, "I forgive him." McDonald dreamed that Jones would join him on the speaking tours, creating an unlikely tag team with a mutual message of peace. But shortly after Jones' release from prison in 1995, he died in a motorcycle accident. The McDonalds' son, Conor McDonald, joined the NYPD and became a sergeant last year. In 2007, Steven's wife Patti McDonald was elected mayor of Malverne, a quaint 1-square-mile suburban community of about 9,000 residents.